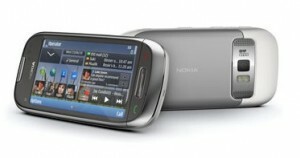 Nokia today announced a new smartphone Nokia C7 – along with Nokia C6-01 and Nokia E7, at the Nokia World 2010 in London. Both Nokia C6-01 and Nokia C7 comes with the Nokia version of the Symbian^ 3 mobile operating system and an 8MP camera with auto focus, LED flash and HD video recording. Nokia C7 has a 3.5 inch AMOLED capacitive touch screen. The design of the C7 is something that makes it different from other C series handsets. The external aluminum-glass finish with soft-curved edges gives it a very impressive look. Like all other C-series mobile devices, Nokia C7 comes with great social media connectivity features and is placed in a very competitive price range. Nokia has added AMOLED display in almost all smartphones announced after the Nokia N8. The AMOLED display is much energy efficient and is capable of producing multi-million colors in small mobile screens. The 3.5 ” AMOLED, nHD capacitive touch screen display in Nokia C7 supports multi-touch gestures, so that the user can view web pages and images galleries with greater flexibility. Nokia C7 is quite a big upgrade from the C6 which comes with 5 MP camera and old version of the Symbian OS. The 8MP camera with dual LED flash in Nokia C7 takes photos to the next level. The device supports Bluetooth 3.0, WLAN 802.11 and high speed 3G data networks. The Symbian^ 3 user interface in Nokia C7 makes the device many user friendly than the old C-series models. There is an option to set a number of home screens with apps, contacts and other widgets. These custom home screens can be selected by using the slide-in operation. The home screen widgets give quick access to social media updates, email. SMS alerts and visual contact lists. Nokia C7 comes with 8GB internal storage, which is further expandable to 32GB using a micro SD card. Other features of Nokia C7 includes free navigation with OVI maps, 3.5 mm headphone jack, Micro USB port, web TV, TV-out,digital compass, FM radio, FM transmitter, music player, A-GPS, 1200mAh battery, 350MB internal memory, music player and full web browser with Adobe Flash support. Nokia C7 will be available in three color options, Charcoal Black, Frosty Metal and Mahogany Brown. Nokia will release the Nokia C7 in the fourth quarter of 2010 in selected world markets. The suggested market price of Nokia C7 is 335 Euros excluding taxes and other charges. So if launched in India, Nokia C7 will cost around 20000 INR approximately. can i know the exact date and the exact price of the phone in india.?? also plz send all featured mobile in nokia with qwerty key board.